Ledaig was definitely one the stars of The Whisky Show 2016 and I made it my mission to try every Ledaig in the building. 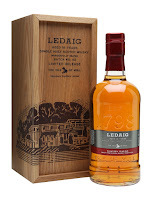 For those that don’t know, Ledaig is the peated version of Tobermory, the distillery on the Isle of Mull. It’s had a history of being closed more than it has been producing but seems to have hit its stride recently with some great indie bottlings. Serge has been quoted saying it’s the new Ardbeg… Hopefully prices won’t increase accordingly. Nose: Quite clean. Brine, sea salt, olive oil and sea spray. Coastal and oily. Taste: Clean again, following the nose with the same coastal and oily flavours. Sea salt/spray, brine, olive oil, growing soot and ash, coal, then more peat. Finish: Medium/Long length. More peaty and smoky. 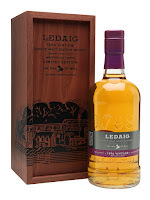 Notes: Not many of the savoury flavours I usually get from Ledaig, but a lovely entry level expression. Up there with Springbank 10 and yes, Ardbeg 10. Nose: Rubber at first, rubber tubing, new bike tyre, then more vanilla and citrus flavours. Creamy and oily. Taste: Soft, aged peat, very oily and creamy mouthfeel, lime citrus and rubber. Finish: Medium length. Soft peat and lime. Notes: Finished in Spanish Sherry casks. The rubber notes don’t detract from this at all actually. Nose: Sweeter than the 18. More Sherry, more spice, spiced orange, soft ginger. 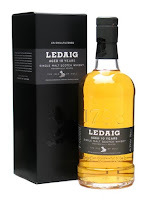 Taste: Peat first on this one, then more spices with ginger, cinnamon liquorice and orange peel. Then goes more malty. Finish: Medium/Long length. Oak and liquorice. Notes: An Oloroso Sherry finish. This just edges the 18 year old but is £10 more expensive. Both come in a nice box though! Next up are the IB’s which really blow these out the water.